We were watching Master Chef the other night, and the challenge was to cook a live lobster. As I was watching, I thought about what I’d do if I were in the contest. I watched each contestant carefully to see how they dealt with the necessary evil – killing the lobster. When it comes to preparing a live lobster, there are a few different schools of thought. The traditional Chinese way emphasizes the taste and cleanliness of the lobster, and calls for a process known as “releasing the ‘urine” by poking the chopstick or thin stick into the rear end of the lobster to release some murky liquid (there is usually a good amount). This is supposed to remove undesirable smell and taste. This method seems somewhat cruel, and the grounds for doing so is somewhat shaky given that most people in the world do not kill lobsters this way but that doesn’t seem to affect the taste for them. If you are squeamish about the whole thing, there are more humane methods that may be considered, such as quickly cutting the lobster in the head right behind the eyes, or simply dropping the whole lobster, head first, into a pot of boiling water. The second approach though, really limits the way that you are cooking your lobster as you are forced to cook the lobster by boiling. 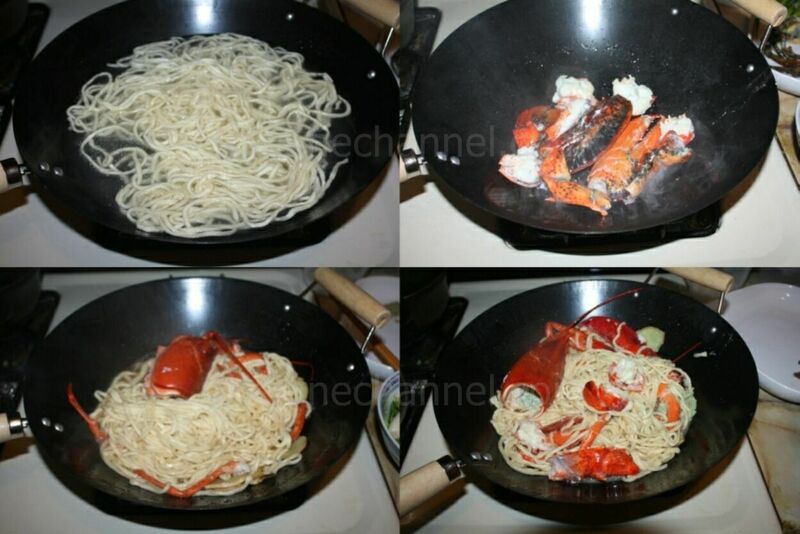 For example, it will not really work with the recipe that is shown here as we would like to use high heat to cook the lobster quickly with a bit of oil as the first step. The other issue is that you do not really have an opportunity to thoroughly clean the lobster before cooking. Ultimately, I chose to use the traditional Chinese approach when making this dish, with a small modification. I heard that low temperatures can help desensitize the lobster significantly or maybe even knocking it out. So, what I did was to put the lobster in the freezer for a while (about 20 minutes), before proceeding with the preparation. Cut off tail and claws. Crack claws using the back of the large knife (to help seasonings enter the meat). Cut tail into bite-sized chunks. Thoroughly clean all pieces using a small brush and water. Sometimes, you see dark green/black intestines that run through the length lobster. Make sure you discard that and rinse thoroughly. Finally, use paper towels to dry the lobster pieces and dust them with corn starch. Cook the noodles in a pot of boiling water for 1 minute, drain and set aside. Heat oil in a wok over high heat. Add ginger and part of the scallions, stir fry until fragant. Add lobster pieces (except head) to wok and stir-fry for about 2 minutes, until the shell starts to turn orange. The lobster should only be lightly cooked at this point. Remove lobsters from skillet. Heat oil in a skillet over medium-high heat. Add noodles and chicken broth. Bring to to boil, add lobster head. When it boils again, cover and simmer for 2 minutes. 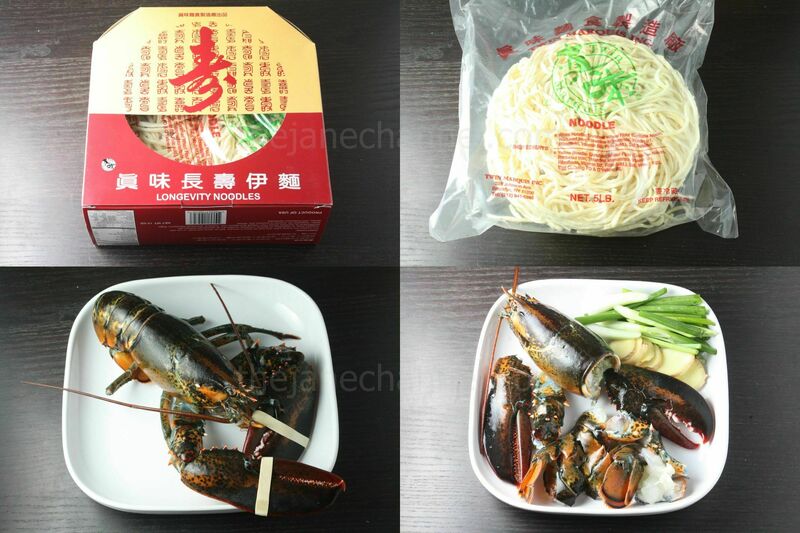 Turn the heat to high, add lobster pieces to cook together with broth and noodles. Cover, cook for 3 minutes or until everything is cooked through. Add remaining scallions, white pepper and cooking wine and drizzle sesame oil. Mix everything well and cook for another short while (10-20 seconds) and it’s ready! I heard the freezing method too, that’s what Chen did with his crabs before he made curry crab for me… your dish looks delish!!! Thanks Elaine! I should use the same method with crabs next time. I can’t believe you are so fast. I just get your comment yesterday and you already try the meal. Your cook looks so great. Everytime I make this meal, I think I need losts of people to finish it so I didn’t make it often. But your recipes let me know, I can buy a small lobster to make it for lunch. 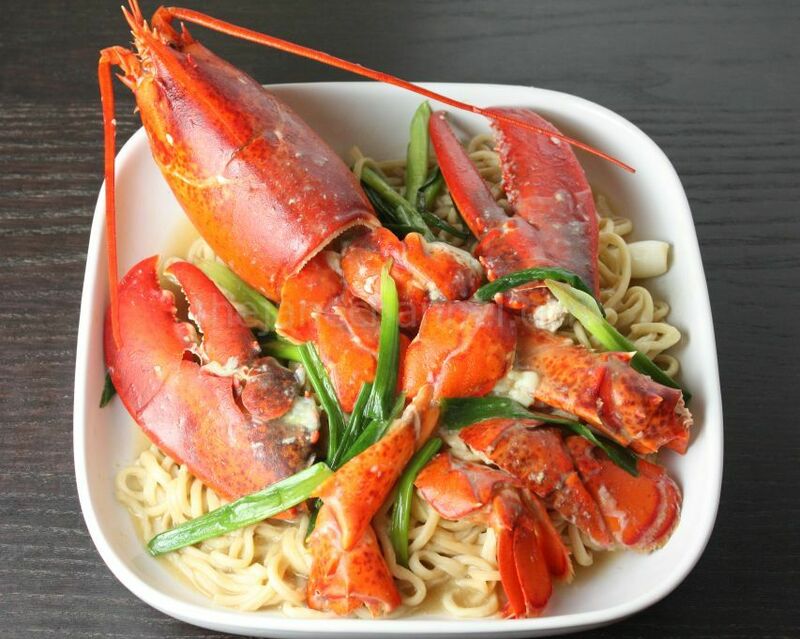 I need to go have some lobster chow mein sometime. however, when i try to copy and paste it to email and send to helper, the background is always dark brown. any way i can fix this?